Backbone MRP is a system for real-time production management with complete bills of material for every single part produced even if you never run the same part twice. This allows you to effectively address the most critical challenge facing manufacturers – ensuring you consistently have the right materials at the right place at the right time. Every manufacturer could benefit from improved material resource planning but MRP systems are generally complex and costly add-ons to large ERP systems. Our flexible, standalone design allows for smooth implementation to any level of detail in stages with minimal disruption to your operations. We designed a system that is customizable and cost effective for manufacturers of all sizes and types. From day one Backbone will begin to drive your factory more efficiently – mapping orders, parts, and BOMs to your production, plant transfer, and purchasing schedules. Having this level of centralized control of purchasing, stocking points and production prioritization will ensure all orders get out the door on time. Our scheduling and inventory tracking provides you with the detailed information you need to minimize your inventories and maximize process efficiency. If you are making production and purchasing decisions based on manual inventory counts, your reaction times are slower, your inventory is higher and your customers’ lead times are longer than they need to be. 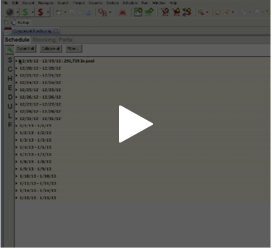 With our production scheduler tool you may sort jobs in the pool by due date, order date, or any other criteria. Select your target jobs and simply drag them from the production pool on the right to the schedule on the left and voila your job is underway! Our unique templating approach simplifies the process of entering parts insuring you increased order accuracy. MRP systems are only as good as the extent to which they accurately reflect your business. Entering parts into an MRP system has historically been cumbersome and error prone. Backbone MRP’s unique template approach to parts entry allows you to define rules and simplify the process of entering parts. Our part configurator’s unique interface allows you to create hundreds of parts within minutes. Use paperless workflow management to improve your business communication, enabling you to keep your entire operation in sync to fill orders on time. Backbone seamlessly integrates with Quickbooks, Dynamics GP, and SmartTurn. Flexible export and import points are provided for integrating with other systems using data files.